Start Seeing CVI t-shirts are now available for purchase. You can order kids sizes here, and grown up sizes here. Half of proceeds will benefit the Pediatric CVI Society. The original t-shirt design, pictured at right, and on our Facebook page, can be ordered in kids sizes here. This design and the terms used to describe the ten characteristics reflected the then current language used around CVI, and comes from Cortical Visual Impairment: An Approach to Assessment and Intervention by Christine Roman-Lantzy. 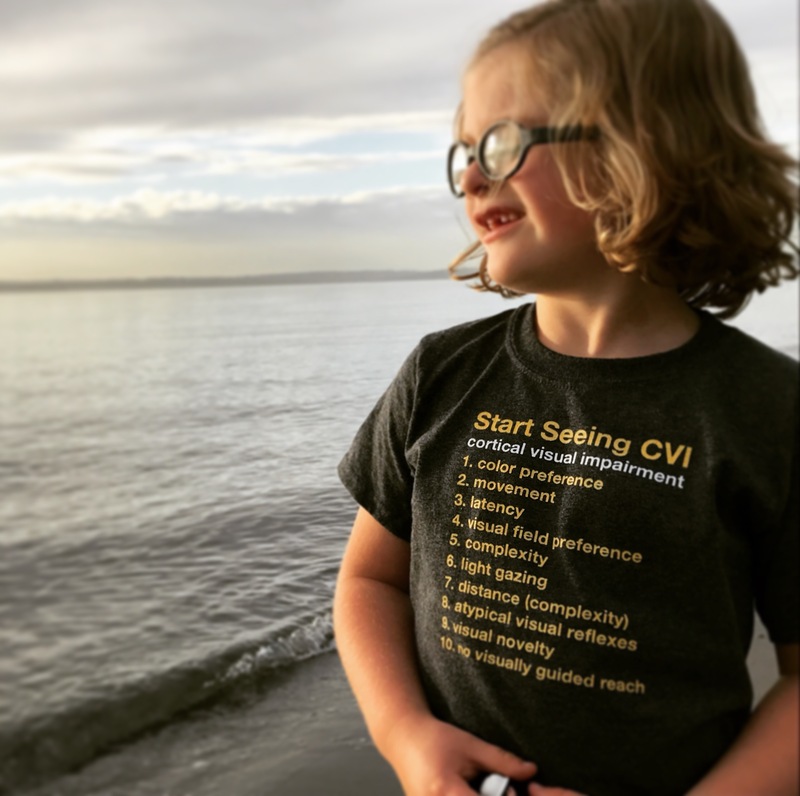 The t-shirt idea, along with the name, Start Seeing CVI, was born out of a parent’s frustration from dealing with providers who had never heard of CVI, and the constant explanation of both my son, and his vision disability. This happened by the time he transitioned from birth to three services to the public school system. The t-shirt was made as he began preschool, with a new team that either did not know CVI at all, or did not know nearly enough. His new IEP team strongly recommended instruction in Braille, and this CVI mom declined. And I sent my son to school wearing his Start Seeing CVI t-shirt. Start Seeing CVI. So that early childhood educators, occupational therapists, ophthalmologists, optometrists, orientation & mobility specialists, pediatricians, physical therapists, special educators, speech language pathologists, and teachers of the visually impaired can Start Seeing Cortical Visual Impairment.